It looked like a reunion of the Shirley administration Sunday as 300 people crowded into a tent lashed by one of Chinle's trademark dust storms to launch Joe Shirley Jr.'s third campaign for Navajo Nation President. Former Shirley aides Patrick Sandoval, Clinton Jim and Julius Elwood were in attendance, along with former division directors Samson Cowboy (Public Safety) and Cora Maxx Phillips (Social Services), and many other familiar faces from Shirley's 2003-2011 tenure as President. "All the people who support Dr. Shirley now, they supported him before and will support him in the future," Sandoval said. Council Delegate Alton Joe Shepherd (Jeddito/Cornfields/Ganado/Kinlichee/Steamboat) who worked in law enforcement under Shirley and recently gained political clout by leading the charge to oust Johnny Naize from the Speaker position, got a standing ovation as he rose to support his old boss. "We saw his leadership in the reduction of the Council (from 88 to 24 members)," Shepherd said. "Since them we haven't seen any more government reform. We haven't seen any more leadership. Local bigwigs like former Apache County Supervisor Jim Claw, whose old seat Shirley now holds; Chinle Unified School District Assistant Superintendent Gloria Grant and Juanita Gorman, who donated her grazing land for the Chinle Comprehensive Health Facility, also rose in support of Shirley, with Grant describing him as "the person who needs to get us over the hump and down the road. 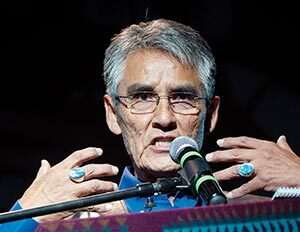 Grant and several others said they had been "waiting" for another Shirley run after his forced hiatus under Navajo Nation law, which prohibits a President from serving more than two consecutive terms. Others said they were "embarrassed" by the current Navajo Nation government and were counting on Shirley to bring back integrity, as he promises in his campaign literature. Jim took the opportunity to attack the Rangeland Improvement Act currently being discussed in Council, calling it "another form of livestock reduction. Elwood took current President Ben Shelly to task for his support of the wildly unpopular Colorado River Water Rights Settlement, failing to ensure that the Navajo Nation got the first water from the Navajo-Gallup Pipeline, and going soft on uranium mining. While new candidates are touting "change," Elwood warned the attenders not to be too enamored of change at all costs, "With that change, a lot of times, comes inexperience," he said. Supporters from as far away as Red Mesa and Tuba City also showed up for the rally, including Utah businessmen Manuel Morgan and Victor Dee. Former Apache County Sheriff Brian Hounshell and his wife made an appearance. Shirley himself moved easily through the crowd, looking like a seasoned pol in his element. He spoke just briefly, putting out his campaign slogan "Moving forward together" and promising to restore integrity to the Navajo Nation government. Only one of Shirley's potential opponents, Nageezi Chapter President Ervin Chavez, showed up for the rally.